The Walton's family is shown during the filming of A Walton Thanksgiving Reunion (CBS, November 21, 1993). The family reunion is marred by news of President Kennedy's assassination. 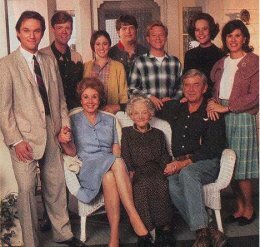 John-Boy has become a Washington, DC-based TV commentator, Mary Ellen is a doctor, Jason is a professional musician, Ben cuts lumber with John at the mill while Olivia and Grandma maintain the house, Erin is a schoolteacher, Jim Bob is a pilot, and Elizabeth joins the Peace Corps. The picture was reproduced from a magazine article dated November 19, 1993. The following table list various facts about The Waltons. Please help me collect this information by correcting mistakes and adding information that is missing. My email address appears at the bottom of all pages.